Ask not what my customers and fans can do for me? Ask what I can do to engage with them more effectively? As we transition from the age of information to an age of engagement, brands and marketers are seeking the best ways to have their customers engage with them. It’s often difficult because every market is different and consumer interests morph at a rapid pace. Regardless of what market you may be in, there are still several universal truths you should keep in mind to have the best engagement with your customers. As you know, relationships are the key to life. It doesn’t matter whether you’re talking about family, friends, or those you consider to be very close to you. Even having professional work relationships are valuable and play an important role in helping you get ahead in business. 1. Analyze the data from your social media insights and Google Analytics for your community’s likes and dislikes. 2. Post content that’s relevant, fun, and engaging for members of your community. 3. Engage with them on a personal level via replying back to their comments and going live on social. 4. Show love and respect by tracking, recognizing, and rewarding the right behaviors. 5. Allow your customers to become co-creators with your brand by creating value-based behaviors that lead to the expansion and success of your brand. You can do this by providing either simple acknowledgments (e.g., thank-yous) on various platforms or more direct and personalized ways of showing appreciation. There are arguments being made that app fatigue is real and can cut into productivity. But the numbers above don’t lie. More people are seeking new ways to connect with their brand on a personal level. Facebook, Instagram, Snapchat, and Twitter all offer different functionalities to help communities interact with their favorite brands and influencers in a variety ways. But what these platforms fail to do is establish a relationship of value between consumer and brand. If you’re a brand or influencer, isn’t it important to take notice of these numbers? With two entire generations under 30 years old using multiple apps on a daily basis, now is the best time to take notice and action as the trend in app usage continues to only get stronger. ccording to TeenSafe, 1 out of 5 students are cyberbullied. Adults are not immune to it either. In 2014, AdWeek reported that 40 percent of adults are bullied, whether it happens face-to-face or online. It’s not just bullying that’s an issue though. Going on social media platforms such as Facebook and Instagram can have a negative effect on our own perception of ourselves. Approximately 60 percent of people using social media reported that it has impacted their self-esteem in at least one negative way. Brands like Dove, TEM, Always, and Nike are great examples that have inspired many individuals around the world to raise their self-esteem. These brands and others like them have been doing it for years. The sense of loyalty they engender from their customers and communities is great! One of the effective ways to build a successful brand is to reward the very people who’ve made the brand a success in the first place. I’m not talking about the casual fan or customer. I’m talking about the super-enthusiasts who engage with your brand on a daily basis. The ones who rep your brand as if it’s the only thing they have. The ones who only use Apple products and wouldn’t even dare touch an Android. The ones who only wear Nike when they work out. Do these brands always have the most effective products to own or wear? What is certain is that these brands have engaged their customers in a way that most other companies haven’t. They’ve held contests for their followers and given out rewards through campaigns. In a world filled with gamification concepts such as points and badges, companies like Skylab have cracked the code on sustained engagement. They have leaped beyond gamification by including a VRS platform (Value Reinforcement System), achieving engagement rates 11 times higher than Instagram. When you combine the tracking of behaviors inside apps with real-life rewards and experiences, you begin to leverage technology to enhance humanity. hat’s the point of your business being successful or having a devoted tribe if you’re not giving back to those who helped you be successful? 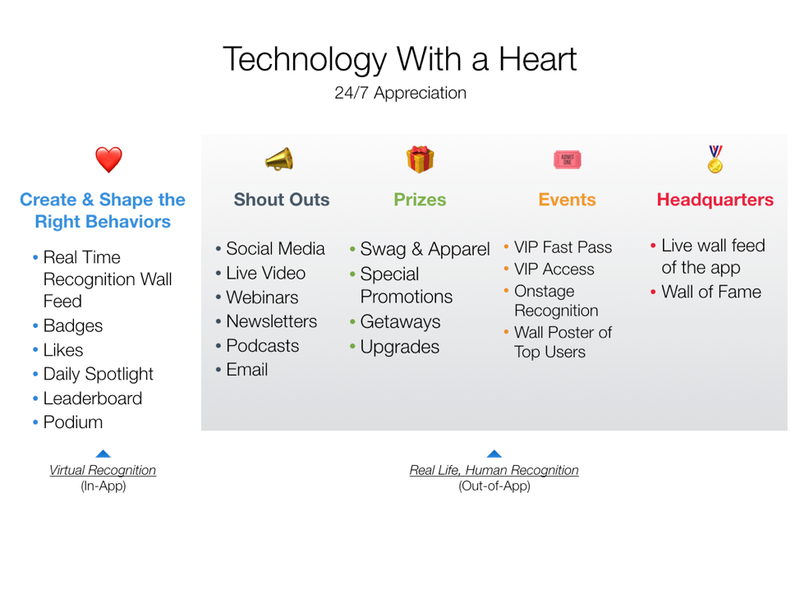 The graphic above shows many of the ways you’re able to show appreciation to your loyal tribe. Simple things like even a shout out make an epic impact and create positive ripples through your community. People want to be noticed and appreciated. What aspects of the graphic above are you implementing in your business or tribe? It’s not an overnight process to engage with your community effectively. It takes time, patience, and, like any worthwhile relationship, it takes trust. Engaging your community in multiple ways such as implementing a Value Reinforcement System, delivering quality content that’s relevant to them, or simply inspiring them to feel better about themselves are all great ways to build a solid relationship between brand and consumer. In a world with so many distractions & gamification tactics, competing for your customers’ attention is the new currency. For more information on Value Reinforcement Systems, refer to the White Paper (The Science of Engagement) published in the scientific website Research Gate.